The New Richmond Exempted Village School District has joined 42 other public schools in Clermont, Hamilton, Clinton, and Warren Counties to form the Greater Cincinnati Schools Advocacy Network (GCSAN). This group of schools is comprised of hard-working students, parents, and teachers from great communities that are striving to do great things for our students. However, we have found our job more difficult to do in recent years due to requirements and regulations placed on us from state and federal government. Based on a random survey conducted for the GCSAN by the respected Fallon Research and Associates, many people in our community agree. 60.4% believe that increased mandates placed on public schools have not been helpful to increase student achievement. 67.8% believe that increased mandates placed on public schools have excessively burdened the local taxpayer. 78.1% believe that the most innovative ideas that create student success come from teachers, administrators, and locally elected school boards. 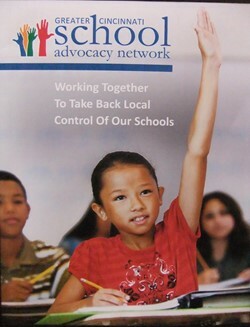 80.8% believe that the State Legislature should reduce mandates and give more control to local school boards. 93.8% believe that privately-operated charter schools that receive public dollars should be held to the same transparency and accountability as public schools. The challenges faced by our young people today are in some ways greater than ever before. I don't have to tell you about the effects of poverty, domestic abuse, and drug/alcohol abuse that negatively impact the ability of children to learn. Let’s not put additional roadblocks like excessive testing and additional graduation requirements in their paths. I believe that there are some reasonable, common-sense steps that can be taken to improve education in our state and community. Increase the local control of education by empowering local boards of education to make decisions that are in the best interest of the students in our community. Decrease the amount of funded and unfunded mandates that take away a school's ability to focus spending on students in the classroom. Decrease the amount of required testing. Let local schools decide how to best prepare students for life, career, leadership, and productivity. These decisions would be made by the local board of education reflecting the values and standards of the local community. I would ask our legislators to pass legislation that requires ALL State Board of Education members to be elected. Currently, the majority of this State Board has been appointed by the Governor. This creates a situation that gives one branch of government too much power. New Richmond EVSD is funded $1,750 per pupil by the state of Ohio. However, for every student who attends a public charter school, an average of $7,521 is deducted from our state funding, for a total of $308,000 taken away from NREVSD. That difference comes from local taxpayers. In light of the closing of the Beckjord Power Station, our district cannot afford to supplement this amount anymore. I would ask our legislators to limit the charter school per pupil deduction to the actual amount that our district would have received from the state. I would ask our legislators to hold charter schools to the same level of financial and academic oversight by which public schools are evaluated. I welcome financial and academic transparency for New Richmond EVSD, but I believe that charter schools, accepting millions of public dollars, should be held to same level of public accountability. I would ask our legislators to introduce and support legislation to restore the Public Utility Tangible Personal Property reimbursement for 2017 and that it be enacted prior to Dec. 31, 2015. Our local tax on the generation of electricity has already been confiscated once. Let’s stop the elimination of additional funds for New Richmond Schools. No one loves our students, schools, and community like the residents of the New Richmond School community. Let’s return the ability to make decisions that are best for our students back to our community.